The White Helmets are al Qaeda auxiliaries. They are misogynist, sectarian, anti-Christian terrorists. 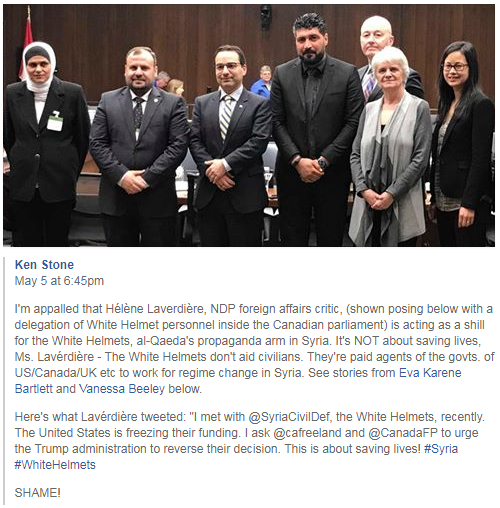 Canada supports them and all of the sectarian, anti-Christian, misogynist terrorists invading, destroying, and occupying parts of secular, pro-Christian, pluralist, pro-equal rights, civilized Syria. Canada, NATO, and their allies, including the Wahhabi Kingdom of Saudi Arabia, Qatar, and Apartheid Israel, have been supporting (all of) the terrorists with a view to destroying Syria and implementing “Regime Change” (God forbid), for the last seven years now. 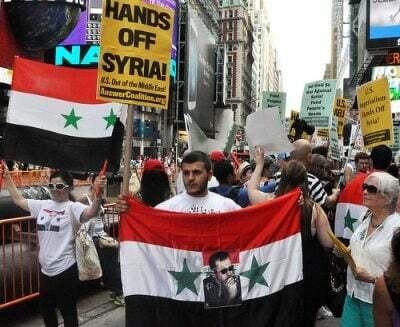 Syrians, for the most part, are staunch supporters of their democratically-elected, secular, pro-Christian, pro-equal rights, government. The video below was taken shortly after France, the UK, and the US criminally bombed Syria with their cruise missiles on April 14, 2018. Syrians in the video are rallying in support of their government. Sarah Abdallah, for her part, notes that Christians in liberated Aleppo now have the freedom to attend church and celebrate First Communion, freedoms that the church-destroying, anti-Christian terrorists denied them. From Aleppo, free of ISIS and Al-Qaeda jihadists, Syrian Christians observed the First Communion at the Saint Dimitrios Church. In stark contrast to Syrian government-secured areas, are (Western-supported) terrorist-occupied areas. 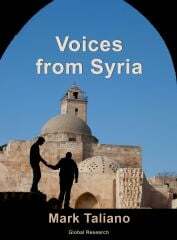 In the video below, investigative journalist Vanessa Beeley interviews a former captive of Eastern Ghouta, now liberated by Syria and its allies. The woman tells a harrowing tale of child abductions, organ harvesting, starvation, and myriad privations and humiliations. Canadians who cherish Truth for Freedom and Justice, who cherish religious freedoms and freedom from terrorism, must surely denounce Canada’s barbaric foreign policy, concealed as it is, beneath lies and fake progressive fronts.